Would a Year 7 Progress Check Help or Hinder Pupils' Progress in Maths? 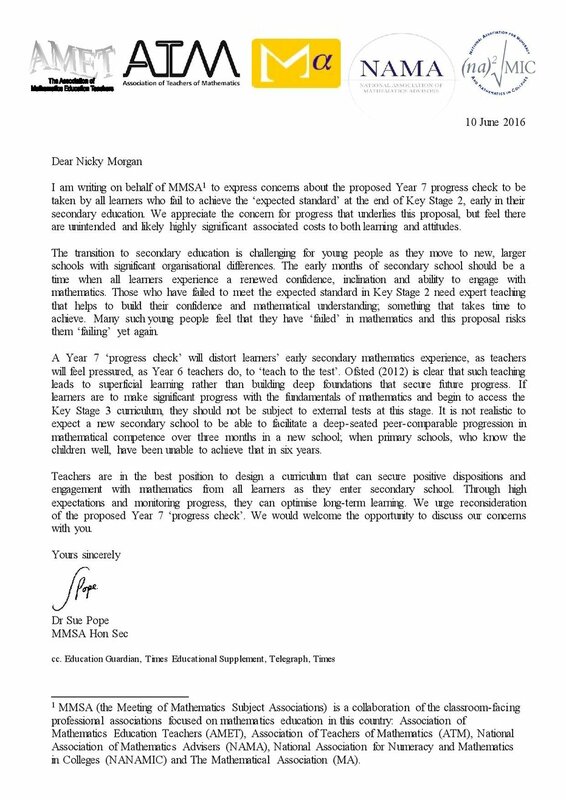 Last week, the combined Maths subject associations group, the Meeting of Mathematics Subject Associations (MMSA) wrote an open letter to Nicky Morgan outlining their strong concerns with enforcing the Year 7 ‘progress check’ for those that fail to meet the ‘expected standard’ at Key Stage 2. 1 step forward, 2 steps back? In the current system, it is already difficult for teachers to ensure that every child is making the expected progress. With the possible introduction of the Year 7 progress check, this would only provide a distraction to every teacher’s goal of maximising each child’s progress. If the Year 7 progress check was introduced, pupils already feeling vulnerable from transitioning from Key Stage 2 to 3 will be plunged into these adapted tests. Some of these children will be seeing secondary school as a new chance to show they can be better – the progress check will only remind them of what they weren’t – hardly what any parent or teacher would want. For teachers, this will only put more pressure on the profession to change one result. They will now have year round exam pressure with Year 7 until Christmas and Key Stage 4 thereafter. Will teachers now be expected to juggle two schemes of work from KS2 and KS3 in parallel, in order ensure that each child is up-to-date? Within the secondary school system, initial baseline assessments take place which are then used to assign classes accordingly, Each child within the class studies a varied, carefully designed scheme of work in order to ensure mastery & appropriate challenge. However, by layering the pressure of these tests, teachers will have to yet again sacrifice precious learning time to teach children how to pass a test which doesn’t lead to longterm learning nor a love of Maths. At the secondary school where I taught there was a child, who under the old taxonomy of National Curriculum Levels, would have been deemed a ‘failure’ when he entered Year 7. After working on building his core foundations, teaching him strategies on how to learn and reflect on his learning as well as working with his parent, his attitude towards Maths completely changed. The result? He achieved an ‘A’ in his recent mocks. None of this involved retesting. Teaching children how to learn, feel what success is like and enjoying their lessons are key to unlocking their future potential – a test doesn’t do this. Let us consider the possible options on the assumption that the Year 7 progress check goes ahead. One would be to have initial assessments for the year group like normal for secondary schools and group the children who need their foundations strengthened alongside those that did not reach the ‘expected standard’. Potentially, there would need to be separate interventions that are run solely on the group that need to retake their KS2 progress check. Another idea is includes having a different set for those that do not meet ‘expected standard’. In the world of teacher shortages and scant resources, this would be difficult to accomplish (not to mention the likely ‘labeling’ the child will experience). Another option might be to build ever closer links with your feeder primary or secondary school to ensure that key information can be shared in advance such as the number of pupils that are likely to require a Year 7 progress check. Data is already shared, but could more be done? One thing we are left to wonder – what happens if a child ‘fails’ the Year 7 progress check – do we go back to normal teaching? As with many ideas, much of the detail is left up in the air. Teachers have enough to do without this uncertainty. Let’s find a better way to ensure that the transition to secondary gives pupils a positive introduction to the KS3 Maths curriculum. Click here for the complete letter from Dr Sue Pope on behalf of MMSA. Liked this? Read more about the future of assessment in primary schools in our new blog post. Tushar grew up in London & taught for over three years before becoming a Numeracy Coordinator. He works at Third Space to help our pupils become great mathematicians.